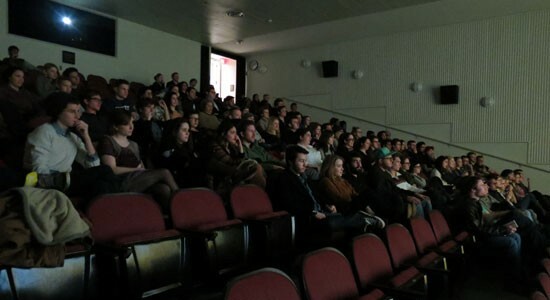 Last Sunday I had the pleasure of attending the 2nd Annual 48-Hour Film Festival, a collaboration between CCM’s Drama and E-Media departments. I didn’t know what to expect; sometimes I think of short films as experiments in self-indulgence and pretension. But these 8 films were high caliber productions, demonstrating the amazing creativity of the students at the University of Cincinnati. Six of the films were in early, one was right on time, and the last showed up just before it was scheduled to be shown. This is quite an accomplishment. Some of these folks had not even met one another two days ago and they had a very short amount of time to write a script, shoot a movie, and edit it all. It’s remarkable what they accomplished. There were 88 total participants, with seven students visiting from Kenya. You can read more about Hess’s Kenyan connection on his blog. Each film was different, creative, and unique. I’m posting them each here, as they are shared on YouTube or everyone to see. I liked them all but my personal favorites were TO DO LIST and PURPLE TO RED. TO DO LIST. Team: Spencer Lackey, Maddie Paige Schmidt, Marissa Hecker, Meg Olson, Areielle de Versterre, James Engbert, Austin Baker, Austin Opata, Kelsey Keiser, Laura McCarthy, Joey Lang, and Fabian Jesuthasan. PURPLE TO RED. Team: Jean Akinyi, Kameron Richardson, Colin Edgar, Landon Hawkins, Claire Gryce, Owen Alderson, Gabriella Divincenzo, Mary Elizabeth Monda, Thomas Stocker, Clare Combest, Nick King, and Haroon Khan. KATALINA’S ATTIC. Team: Bartley Booz, Jacob Berry, Katie Langham, Mafer Del Real, Benjamin Bollon, Logan Greenwelll, Alex Constante, Haley Wolf, Angelika Modawal, and Ashley Kreischer. CONNECT. Team: Muriithi Mwangi, Sarah Durham, Kenzie Clark, Ethan Finder, Josh Reiter, Nicholas Heffelfinger, Bethany Hickman, Katie Ferchen, Alice Skok, Heather Ballish, Madison Hoffpauir, and Laura Walters. SUNDAY. Team: E. M. Mwangi, Annie Grove, Sam Beiting, Jabari Carter, Olivia Passafiueme, Devan Pruitt, Sydney Martin, Sam Medert, Alison Sluiter, and Yiyang Xu. WANDERING. Team: Keisha Kemper, Natalie Sehweil, Michaela Tropeano, Jesse Circelli, Carter T. LaCava, Carissa Cardy, Zippy Okoth, Anjanisse Collins, Viv Varghese, and Madeline Foley. TELL ME ABOUT YOU. Team: Rachel Baumgarten, Chrisine Njeri, Lauren Carter, Ryan Garrett, Colleen Ladrick, Asa Featherstone IV , Jacqueline Daaleman, Lily Burdick, Rupert Spraul, and Benjamin Nelson. EVERYBODY’S TREEHOUSE. Team: Andrew Iannacci, Emily Walton, Daniel Carbaugh, Graham Rogers, Colin Macgeorge, Christai Wu, David Babu, Aly Johnson, Garek Bushnell, Katie MacDonald, and Andrew Ramsey. I’ll be spending most of my evenings this week at a free Play Reading Series at CCM featuring four plays all around the theme of alienation featuring several of the folks involved in this festival. Maybe I’ll see you there?